How well are they flying ? I got a couple thousand of those green wads from a guy in German. Loaded up a bunch and the all keyholed except for the ones I loaded with Longshot. 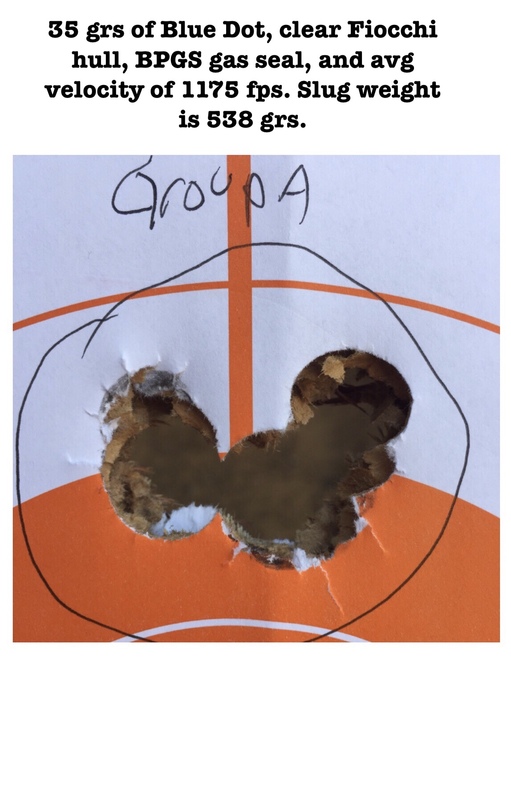 At 50 yards, they were still accurate even with the keyholing. I suspect the wad is too long causing unstable flight. I have some BP18’s I’ll try next. I can't say I have any particular desire for the segmenting slug but I certainly do like the slug/wad assembly with screw from the nose like you and Randy are doing. Having said that I do like it when stuff "blows up"! 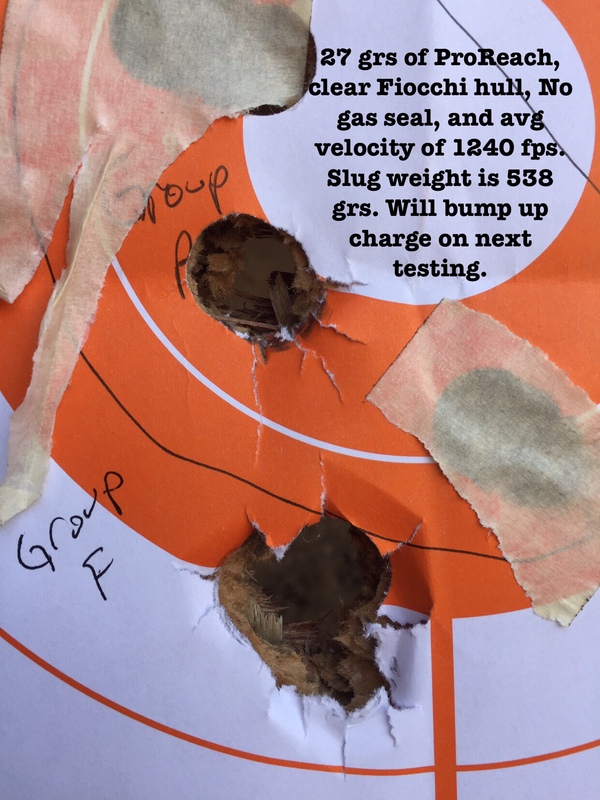 I have to guess if nothing else those segmented slugs would blow stuff up! I'd think just a big HP would be good enough for me for that purpose. Oddly though I watched a video from TAOFLEDERMAUS where he shot an Australian slug with giant HP and it seemed to penetrate as well as blow stuff up! What's not to like there eh!?! That one was for rifled gun but I suppose a guy can attach a wad to about anything. Maybe I should get a rifled barrel? 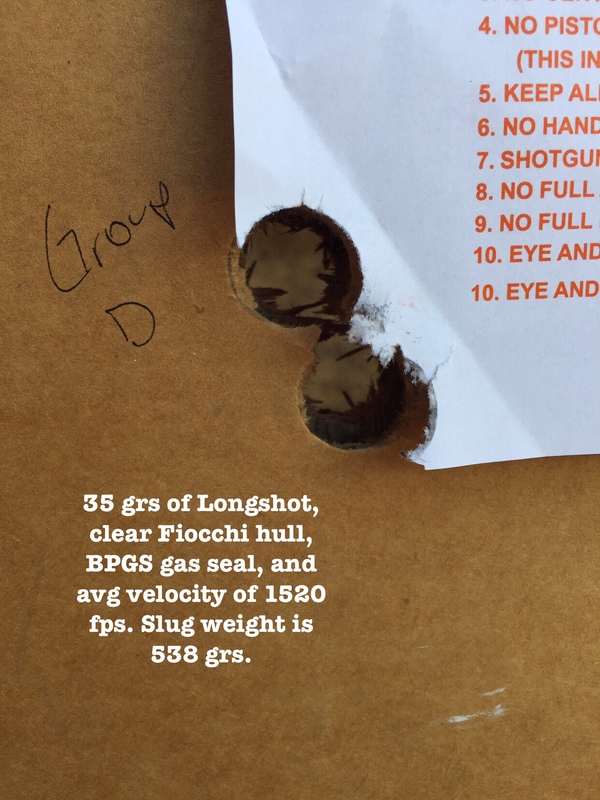 BT from all the shooting you've done with slugs have you picked a powder or a couple of powders that you like better than others? More versatile? 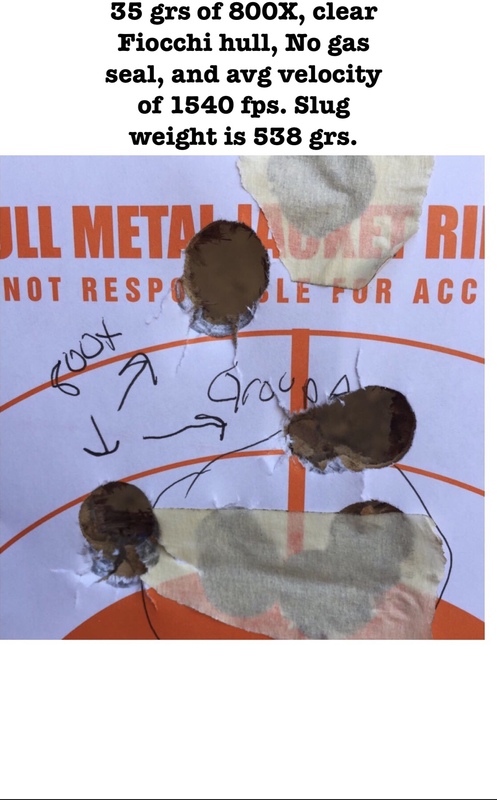 Better accuracy? Better with heavy slugs (over 600 grs.)? 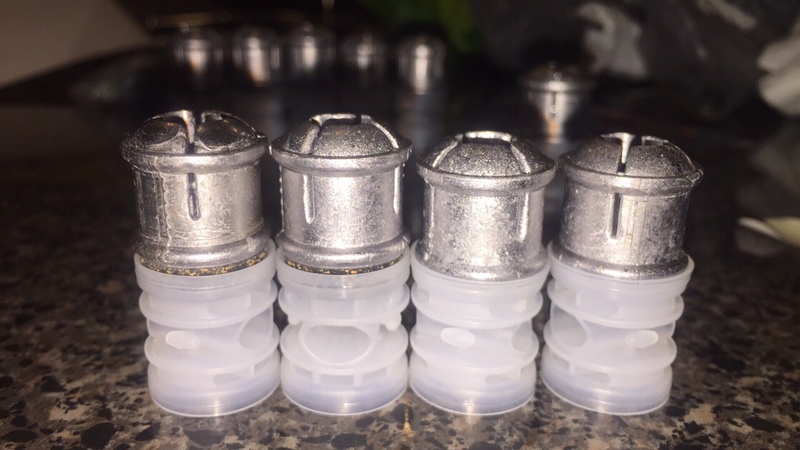 Better with lighter slugs(1 oz. or thereabouts)? OK Here's some of mine. This first batch of castings left a little to be desired but the attachment to the wad came out real nice. #8 x 1" Button Head Sheet Metal Screws 1/16" pilot hole in the wad. Attachment is excellent. I can actually see these flying strait with some better castings. I dunno Randy... I agree they look good but I wouldn't go flashing those thing around with those hardened armour piercing noses! You guys are getting me all worked up now with your attached wad slugs! I am liking these... but I think I'll wait until you test them out. BT seems to be doing pretty well so far. Lets see how yours do. I can modify my full bore moulds and wad slug moulds for screw hole through the nose. What wad are you using? Armour piercing slugs! Hardened nose cone and all. I'm actually thinking of the felt wad attachment that way. 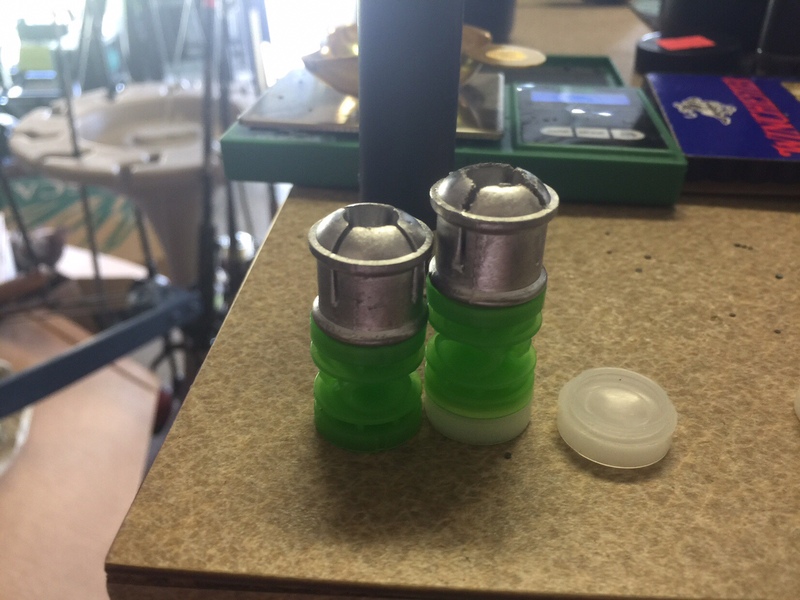 It would eliminated the worry about shotcups compressing the felt and then being punched through by the screw head I have on the bottom of my Brenneke'ized slugs. It is pretty hard felt and screwed down hard but at 10,000 PSI "stuff" happens. I've got several moulds that would be easy to modify. Oh good! More things to try! I'm good at starting projects but tend to get too much going and not enough finished. How about some epoxy sealed tungsten shot in those HP:s? Not too worried about the AP aspect, especially since the slugs themselves will knock down anything all by themselves. 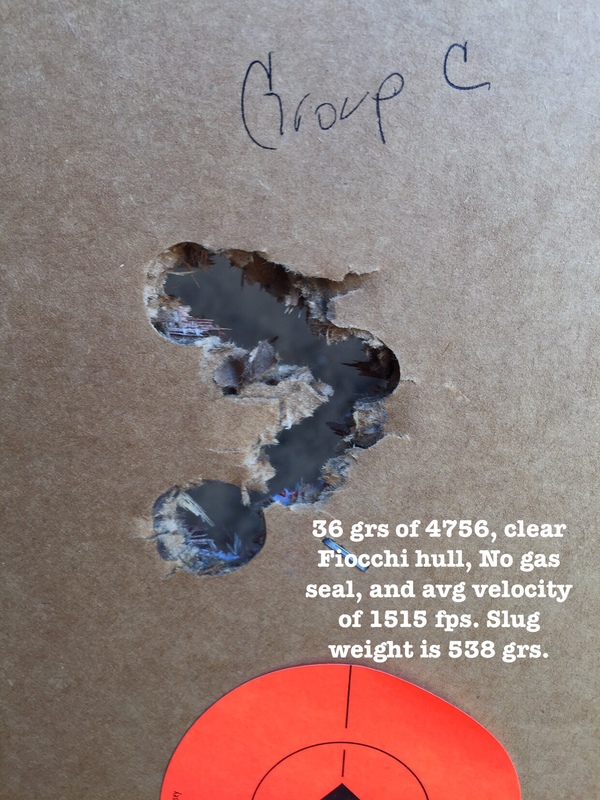 592 grains with wad and screw! It is raining like hell here today so I will be commenting on every topic known to man. Our new Cat, (Tazz) caught his first Rat Yesterday. Big day at our house. Nice healthy Rat too, he was pretty pumped up. This Rat was easily a 2 pounder and I could have taken it with one of these slugs. Big Game in the back yard! Doesn't get any better than that! NO such thing as overkill. My plug in wads arrived from Mother Russia today. will cast up some slugs tomorrow and see how they fit. Are any of you having problems getting these moulds to fill out? I had to run the lead so hot to get it to fill out the Screw on version all were heavily frosted and many deformed. The plug in wad version I started lower and got two decent (not perfect) slugs out of 50 or so attempts. Also having alot of problems with the mould pin sticking and it doesn't just come out when you pull on it with the slug trapped in the lower cavity of the mould. 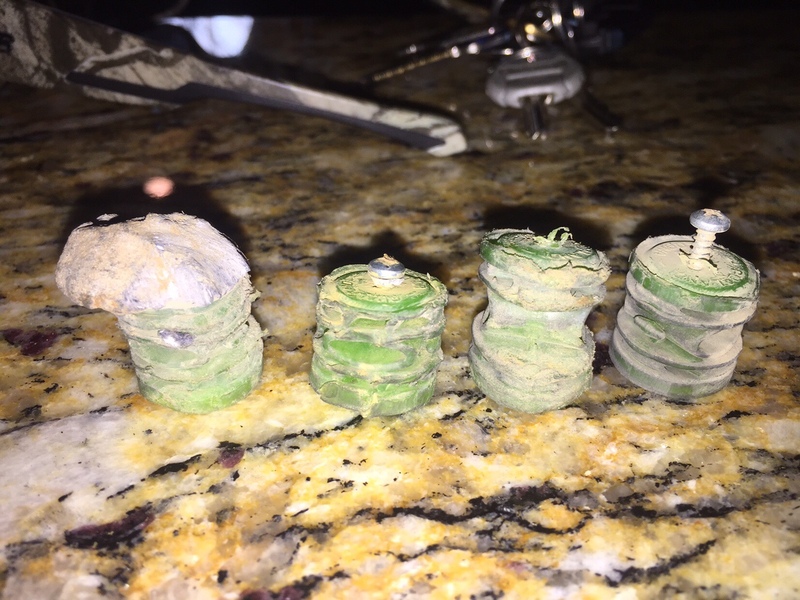 Several were stuck so well they had to be melted off the pin. The wads have to be pressed on and won't be coming off during flight, which is a good thing. Here's a pic of my one good one pressed onto the wad.